I was hoping to get some assistance with translating Mei on a few of my pieces. First piece is attached here. Any help is much appreciated. #1Submitted by saipan59 on Tue, 2018-04-10 02:31. In the database, the smith is likely KAT75. On your first picture, I can see a "Seki stamp" up near the top. This means it is a "GUNTOu" that was made with war-time (WWII) shortcuts. So, not a traditional Japanese sword, but rather it is "militaria". At your convenience, please confirm that you saw my reply. I am NOT the owner of nihontoclub.com (that would be Stan), but I am often someone responding to help requests like yours. My frustration is that way too often when I help someone on this site, I never get a response to my efforts... The latest example is user "A7x" a couple of weeks ago. Am I wasting my time? Perhaps some folks don't understand that reading/interpreting someone else's sword, and using pictures that are often poor quality, takes a non-zero amount of time and effort. #2Submitted by CJKenji on Tue, 2018-04-10 03:26. Thank you so much for the quick response and much appreciate the effort! I did get the blade from someone selling WWII memorabilia and it was in gunto mountings but I thought I would check to see. I do have a couple others I was hoping to get help with and if you are busy or not interested completely understand but if you are let me know and I can post pics of those. However some of them the kanji is a little worn down. Any tips of what I can do to make it a little clearer? 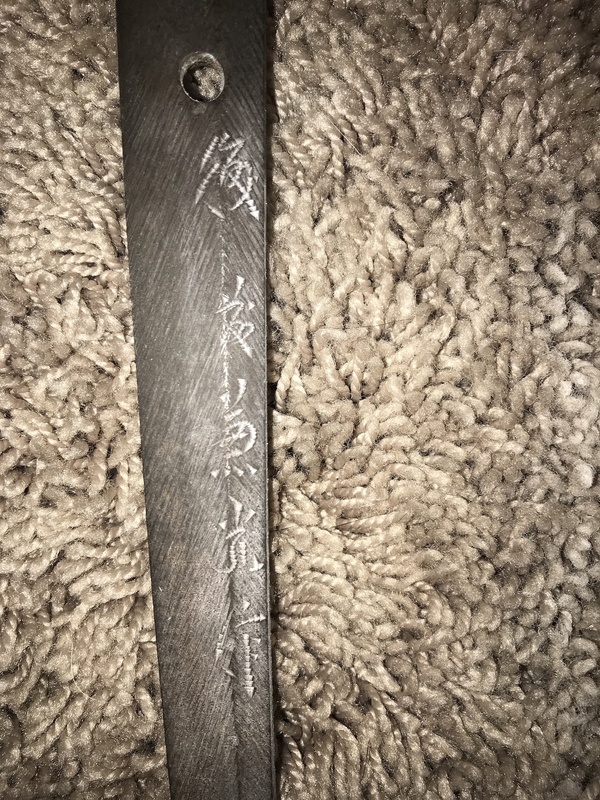 From ebay and such it looks like some people rub wax or something into the mei to make it stand out from the rest of the tang but i never found out what they use. #3Submitted by saipan59 on Tue, 2018-04-10 14:30. Hi, Thanks for your reply to my reply! I would say you should post your other blades in any case - I'm not the only one that will look at them. - You could try doing a 'rubbing' - wrap the tang with thin paper, then use the side of a pencil lead to make an 'image'. - Try dusting the tang with talcum powder. I would use an unscented type. #4Submitted by CJKenji on Tue, 2018-04-10 18:36. Ok, added two pics of another one. Let me know if it isn't clear enough and I'll try to brighten up some. #5Submitted by saipan59 on Tue, 2018-04-10 20:44. NOuSHUu SEKI JUu NAGA-something YOSHINAGA something. If I'm reading it correctly, this is a not-well-documented smith. The second 'something' isn't clear enough in the pictures, but it is likely "SAKU", meaning "made by". It's interesting that the mekugi-ana (hole in the tang) appears to have a copper plug. This MIGHT mean that it's an older blade, and the original hole was not in a good place for the new WWII handle, so they plugged it and made a new hole. However, the tang in general doesn't look very old, so it's a bit suspicious. If you like, post additional pictures of the blade, with ALL metal fittings removed. Such as one of the overall blade, then 3 or 4 of closer views of sections of the blade. #6Submitted by CJKenji on Wed, 2018-04-11 03:05. Ok, I'll take some more pics and see if I can get the signature clearer. The blade is definitely a chisakatana that was cut down probably for a merchant or non-samurai. #7Submitted by CJKenji on Wed, 2018-04-11 04:09. Here are some of the blade. I'll see if I can get a clearer image of the signature. #8Submitted by saipan59 on Wed, 2018-04-11 05:05. Yes, the second "something" is indeed SAKU. Still don't know what the first "something" is. Why do you say it was cut down? The tang is definitely NOT shortened. If the tip-end were shortened, it would be because it was broken. Nobody would shorten the tip-end on purpose. If the hamon in the tip follows the shape of the tip correctly, then it was NOT reshaped (I can't see what the hamon does in the tip in your picture). #9Submitted by CJKenji on Wed, 2018-04-11 17:34. Thanks Pete. So based on this you are thinking it is another WWII make? My assumption of the blade being shortened was because it looked to me like the hamon went a little further down and then cut off at the tang. Also, I checked and it definitely wraps around kissaki so that was shortened. Okay, 2 down. Thanks again. #10Submitted by saipan59 on Wed, 2018-04-11 18:04. Yes, it has many features that make it look like a WWII blade, and nothing that I can see that would indicate an older blade. I think you meant to say NOT shortened. #11Submitted by CJKenji on Wed, 2018-04-11 18:53. Not shortened. Typing faster than thinking. #12Submitted by CJKenji on Thu, 2018-04-12 03:53. Ok this one is the one that the mei was pretty faint so i rubbed some uchiko on it to get an outline. Once again thanks for any insight you can provide. #13Submitted by saipan59 on Thu, 2018-04-12 05:58. The mei is "something KANEMITSU SAKU". If you browse each of the Kanemitsu's in the database, you may be able to matching up the "something". I haven't put any effort into the "something" yet. At a glance, it doesn't look very old either, because the tang has crisp edges, no obvious rust pitting, and the chisel marks in the mei are very crisp and clear also. But I could be wrong. #14Submitted by CJKenji on Thu, 2018-04-12 18:49. Thanks Pete. It does have a little pitting especially on the backside of the tang. Maybe when I put uchiko on it I actually covered them up a little (odd because you would think that would bring them out). Anyway, I see what you mean about the chisel marks. I added some more pics of the blade in case that helps. Although I am a little confused about how to use the database. I searched on kanemitsu in the swordsmith index and it brought up a ton of hits but nothing that would help me correlate to the 'something' before it as the hits all just showed Kanemitsu by itself (which you already identified). I'm sure I'm using it incorrectly so will see if I can get more familiar tonight. #15Submitted by saipan59 on Fri, 2018-04-13 02:31. After searching on "Kanemitsu", you would click on each of the likely candidates, and see if the example signatures use similar kanji to the "something". You could rule out the older ones, such as those before the 1600's. #16Submitted by saipan59 on Fri, 2018-04-13 03:08. Spent some time trying to figure out the "something", but no luck. Also looked through many of the Kanemitsu's in the database for a hint, but no luck there either. Note: The "signature examples" seen the database on this site, or on other people's web sites, are NOT complete/comprehensive. They just represent some documented cases. The more famous the smith is, the more complete the examples are. #17Submitted by CJKenji on Fri, 2018-04-13 03:40. Would you think the first kanji looks like a 後 ? Also thanks for spending the time looking. #18Submitted by saipan59 on Fri, 2018-04-13 15:00. Yes, it's possible... That kanji can be read as "GO" (and probably other readings). Did you find it associated with Kanemitsu? #19Submitted by CJKenji on Fri, 2018-04-13 17:16. Sort of. In KAN1444 it has that referenced for Echigo province but not sure the signature lines up with anything in the reference. #20Submitted by saipan59 on Fri, 2018-04-13 19:17. Not really a match, I'd say. I think there's at least a chance that it is "BIZEN". #21Submitted by CJKenji on Fri, 2018-04-13 19:50. Thanks Pete. I'll continue to look and see if i can find a match somewhere. Guessing it is relatively safe to say the blade is older than WWII though right? #22Submitted by saipan59 on Sat, 2018-04-14 00:00. I'm a little uncertain about the age. It's hard to tell from photos, when there isn't anything "obvious" to point to. Look at the cutting edge, the last inch or two before it goes into the habaki. If it is visibly NOT sharpened there, then it is LIKELY a WWII blade. And compare with your other blades that are certainly WWII - one or both of them may have the "dull edge" feature I'm talking about. 1) WWII "GUNTOu" blades were made this way on purpose for some reason, related to the fact that "shortcuts" were taken. 2) Many blades, even old quality blades, are this way when new. When it is routinely polished over the years, this part of the blade ends up being sharpened also. A WWII blade has never been re-polished after manufacture, so the unsharpened edge is still there. I think option 1) is more likely the right answer. I don't believe quality blades are ever made with a dull edge near the habaki. This is Rich Stein's site. I've 'known' him (e-mail only) for about 35 years. He knows what he's talking about (more than I do!). The tsuba and tsuka (guard and handle) are definitely WWII stuff, and nothing special. So that's a concern, because often the "old family blades" were given better mountings, but not always. #23Submitted by CJKenji on Sat, 2018-04-14 04:30. Thanks Pete. Yes, familiar with that site and glad to hear it is reputable. 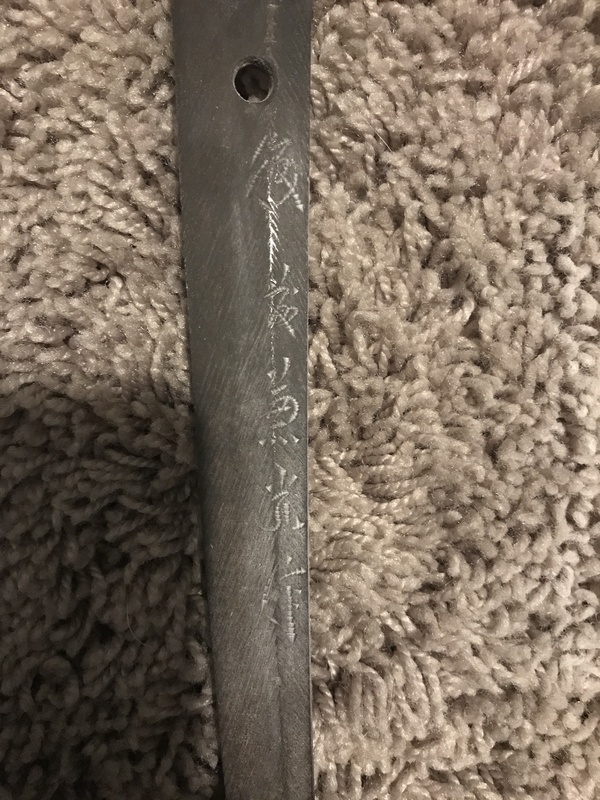 I did check my other blades and one indeed is dull right above the habaki and one is not (oddly enough the one that has the seki stamp is sharp but I’m guessing the seller might have sharpened it). The one above looks sharpened so I guess that is somewhat of a good sign. Either way not looking to sell any of them, eventually would like to learn to polish and restore saya/tsukamaki so figuring out age would be good so I make the fittings age appropriate. Anyway, thanks again for all the help.